Trumpet creeper has a flower 3 inches in diameter. It grows on a climbing vine. The flower has 5 petals that forms a tubular corolla with5 stamens and 1 pistil. Several red flowers occur in terminal clusters.Leaves are compound with 7 - 10 oval-shaped leaflets. The trumpet creeper blooms July through September. The wood lily has a flower 4 inches in diameter. It grows to a height between2 and 5 feet. Flowers are long with 3 petals and 3 sepals. 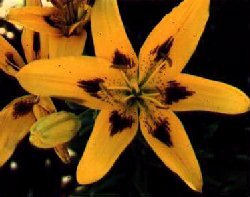 Wood lilies havea bell-shaped corolla with 6 stamens and 1 pistil. Leaves are broad. Black-eyed susans bloom from June through August. The wood lily grows in wet woods, meadows, and thickets. 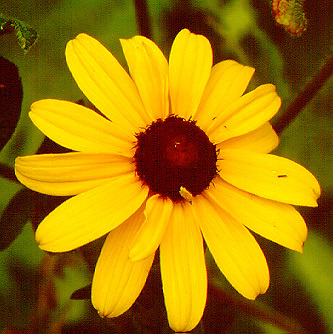 The black-eyed susan originated in the Eastern UnitedStates and spread throughout the continent. Black-eyed susansare found in the Laurel Lake area. The black-eyed susan grows between 1 and 3 feet in height. Flowersare 2 to 3 inches in width. Flowers are conical in the center withyellow petals. Leaves are oval to straplike. Clovers are legumes (members of the pea family). Clover is found inthe Laurel Lake area. Some clovers are annuals and some clovers are perennials. Clover ranges from 6 inches to 3 feet in height and have leaves containing 3 to 6 leaflets. Clover grows wild and is planted by farmers in pasturelands. Clover is also used to enrich the soil by adding nitrogen to the soil. The clover plant onlyuses some of the nitrogen it produces, the rest remains in the soil. 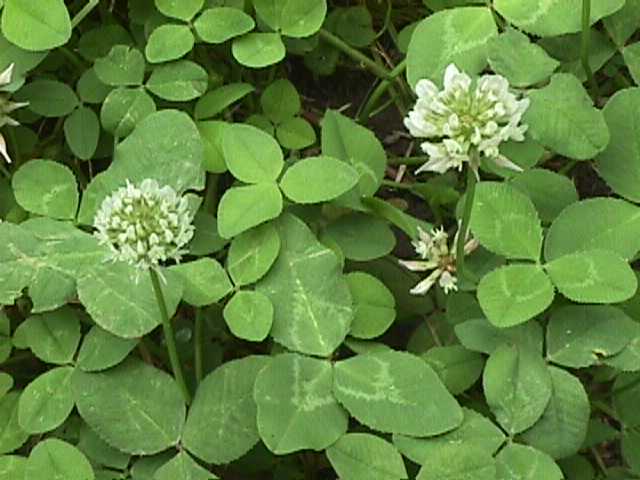 Clover plants produce flowers that are white, yellow, or various shades of red. Bloodroot is a spring flower which grows in the Laurel Lake area. The leaves of bloodroot are deeply lobed and shaped like a kidney. These plantsgrow directly out of the ground. Each stem has 1 blossom that is white or rose tinted. Bloodroot is used in the production of medicines. It contains tanninwhich shrinks tissues. Tannin is also used in the tanning of leather. Fireweed is a spike-like terminal cluster of deep pink and narrow willow-like leaves on a tall stem. Flowers are 1 inch wide with 4 petals, 8 stamens, and 4 parted stigma at the end of the style. It blooms between July and September. Leaves grow up to 8 inches. A fruit capsule of up to 3 inches in length develops. Seeds occur in thesilky down substance which aids in dispersal.